HONOLULU – The state Office of Planning named Danielle M. M. Bass to the newly created position of state sustainability coordinator, effective today. 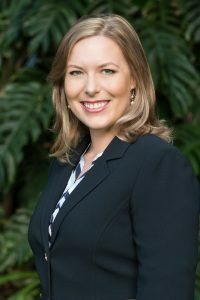 In her new role, Bass will assist the state with implementing the Sustainability Priority Guidelines that are a part of the Hawaii State Planning Act (HRS § 226-108). The position will serve as a sustainability liaison among state and other governmental agencies, as well as private or non-profit organizations, on various sustainability initiatives being performed statewide. The position will also be responsible for establishing broad work plans for state initiatives that promote sustainability, including developing programmatic priorities and budgets, conducting program analyses, making policy recommendations, and preparing sustainability or initiative reports, and other written materials. Bass brings to this position 13 years of legislative experience, including her service as the legislative manager for Rep. Ryan Yamane. In her previous role, she was responsible for community liaising, directing legislative operations, and advising on statewide policy positions dealing with water and land, transportation, health, consumer protection, and tourism. Bass holds a Master’s degree in Urban and Regional Planning, a certificate in Disaster Management, and a Bachelor’s degree in Political Science from the University of Hawaii at Manoa.